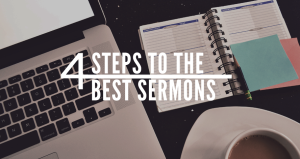 The first step to more powerful sermons is the year church calendar. 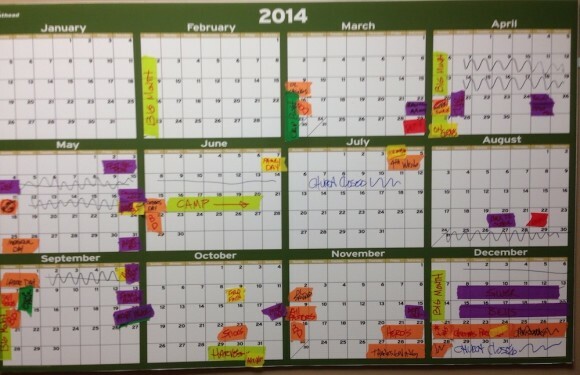 For I don’t know how long, I struggled with scheduling church events. No calendar system really seemed to be good at keeping everything we as a church needed it to do. I wanted something that anyone could add too, but anyone could see what everyone else was doing as well. What we came up with a couple of years ago is an old fashioned wall calendar. Every year at our beginning of the year teaching team retreat, we map out the important dates (holidays, what we know is big times for kids, students, etc) and start with a fresh calendar. If you look at the picture, you can see that there are different colors of masking tape with stuff written on them. Each color corresponds to a different ministry in the church (kids, small groups, outreach, entire campus, etc.). When we sit down at the beginning of the year, we color code those events so we can see what important dates are coming and when we need to lay off of scheduling anything else. We work really hard to be sure that we don’t tire out the staff. You have to take care of them! Those are important people! For example, around Easter we schedule absolutely nothing else. We know that our staff and volunteers are going to need max effort for ministry and family. So we schedule around that. From this year calendar, we start scheduling out sermon series… more on that soon!